Mounting options for flexible solar panels vary depending upon the type of surface they are being mounted to as well as the type of vehicle or vessel you are mounting to. 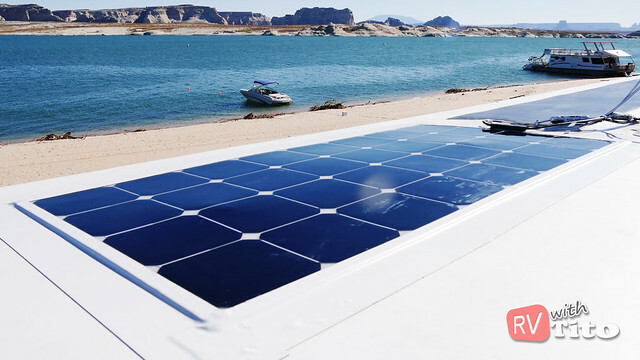 Panels mounted to the roof of a vehicle, an RV for example, will be subjected to high winds and require a semi-permanent installation to prevent the panel from being ripped off of the roof. In a previous article and video I demonstrated one method of mounting that involved drilling holes and driving screws into the roof. This approach was very effective but can expose your roof to leaking if proper waterproofing techniques are not followed. So, if the thought of drilling holes into your RV roof makes you cringe, then this article is for you. An alternate approach is to use an industrial strength weatherproof tape such as Eternabond roof sealant tape to secure the panel to the roof. Eternabond tape is often used to provide a watertight seal on RV roof joints and has a variety of applications. It works on most surfaces and also comes in a variety of widths, lengths and colors which makes it perfect for a flexible solar panel installation. 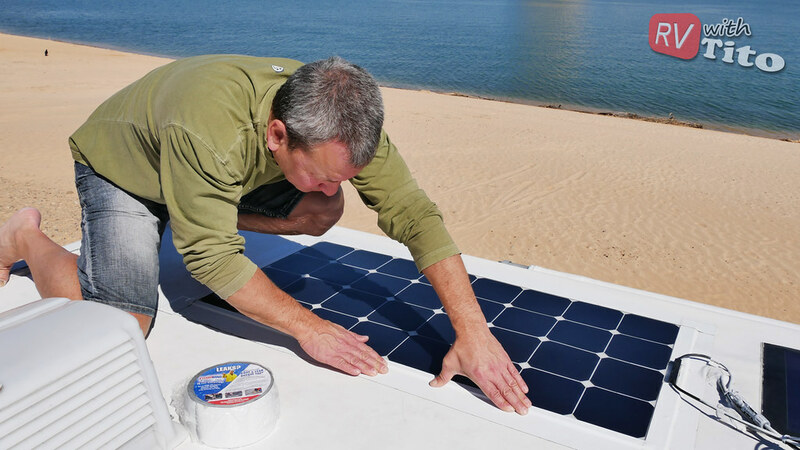 The only downside of using Eternabond tape is that it may be difficult to remove if you should ever need to remove and replace the solar panel. Difficult, but not impossible. Eternibond tape is a great option for mounting these flexible panels. Covering the edges with Eternibond will create a solid bond with your roof and can be an alternative to drilling screws in the roof. Mounting the panel with Eternabond is an easy process. First, make sure you’ve picked the best location for your panel. Then clean and dry the surface very well as Eternabond needs a clean and dry surface to bond to. Start by cutting lengths of the tape to cover the outer edge of the solar panel. You can use a pair of standard household or utility scissors for this. Do not remove the adhesive protective cover from the back of the tape just yet. Just cut the appropriate lengths of tape first. I chose three inch wide Eternabond tape for my install. If you want more coverage you can purchase the four or five inch wide Eternabond tape. Starting on one side of the panel (I chose to start from the rear and work my way to the front) peel back a small section on the end of the tape and stick that down. With the length of tape in position, slowly pull back the protective plastic and stick the tape down. Before applying pressure, make sure the tape is in the correct position. Finally, use your hand or a roller to press down the length of the tape to work out any air bubbles and create a watertight seal on your roof. Now stand back and admire your fine work. I have a white rubber roof on my RV, so I chose the white color tape. This made for a very clean looking installation. The solar panel now looks like it is part of the roof. Finally, I combined the use of inexpensive wire mounts, zip ties and a square of Eternabond tape to create a very strong mounting point to secure the solar panel cables to my roof. Check out the video above to see how I did that. I think you’ll like it. 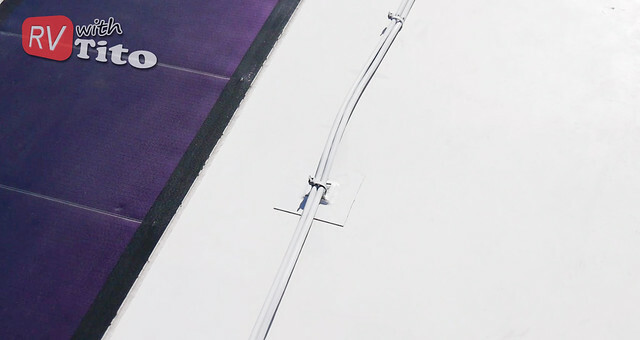 If you prefer to mount your flexible panel using screws, be sure to watch this video.